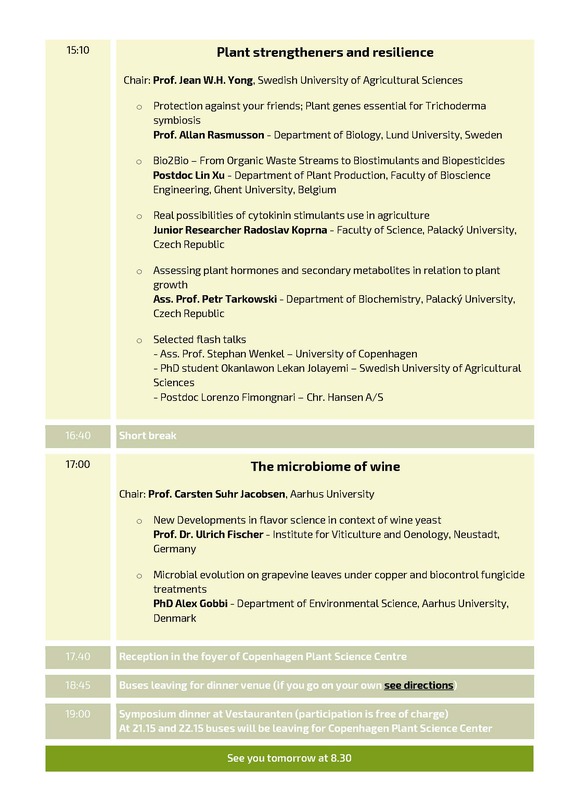 The newly formed Plant Biologicals Network is happy to invite you to our first annual symposium. 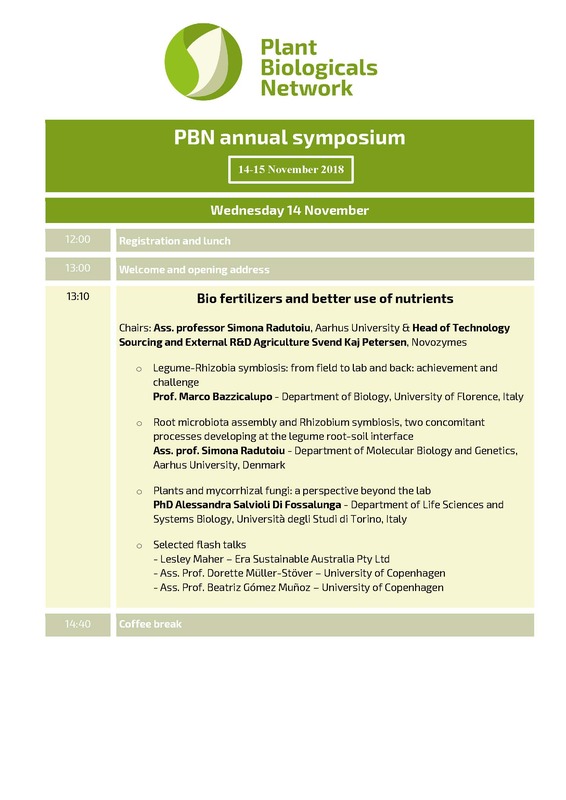 Through inspiring talks, the newest knowledge about biologicals for increasing plant health and productivity will be shared. 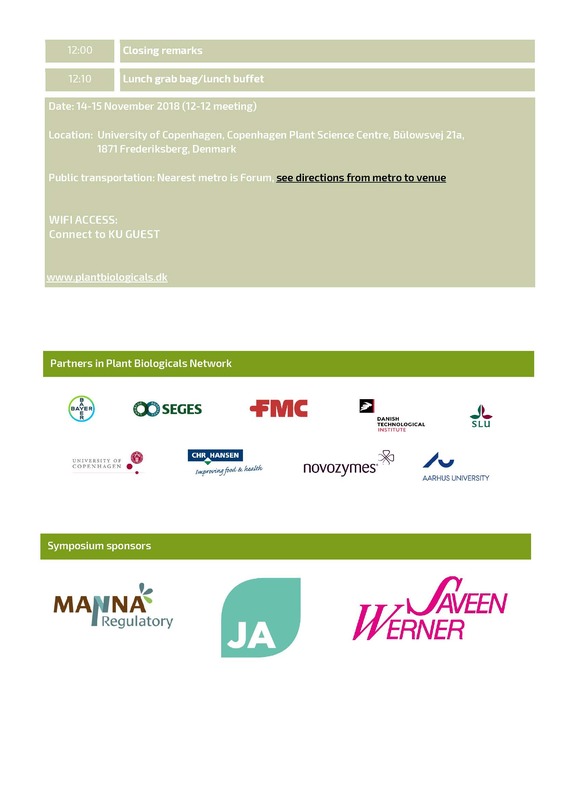 It will be a great opportunity to network with industry, researchers and organizations interested in plant biologicals. Participation is free of charge. Globally we are facing the challenge of producing more food with fewer resources. A growing world population, climate change and shortages of arable land and water require new solutions for agricultural production. Plant Biologicals has emerged as a set of promising technologies to help address some of these major challenges. There is a growing market for these biologicals and Southern Scandinavia has the preconditions to become a globally significant technology hub. Registration: Click here. Participation is free of charge and there is 150 spots. First-come, first served policy. Lunch and conference dinner on the evening of 14 November included. FULLY BOOKED!!! Registration: Click here. Participation is free of charge and there is 150 spots. First-come, first served policy. Lunch and conference dinner on the evening of 14 November included. 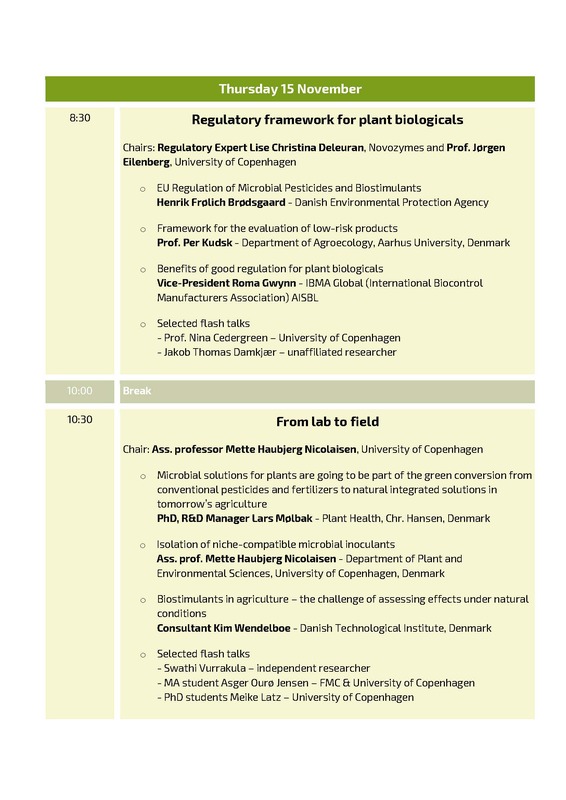 Organizer: The Plant Biologicals Network. Network partners are: Bayer, FMC, Chr Hansen, Danish Agriculture & Food Council (Landbrug & Fødevarer), Danish Technological Institute, Novozymes, Swedish University of Agricultural Sciences, University of Copenhagen and Aarhus University. Abstracts with relevance for each of the symposium themes are welcome. Abstracts will be selected for bringing a poster for the poster session OR giving a flash talk at the symposium as well as bringing a poster at the poster session. Deadline for abstract submission is 1 November. Please use this template for submitting your abstract and mark which theme your abstract is relevant for. Submit your abstract here.